This is an update for May 12th, in the evening, to let you know that we are all back together and we are all the way back down at Pangboche, at Ang Temba's lodge, at the very low elevation of 13,000 ft. We awoke in Gorak Shep this morning to a completely white world; with a lot of new snow and it was continuing to snow very hard in the morning as we took our breakfast in the lodge and started walking down; past Lobuche, past the Sherpa's memorials and down into Dugla. We found Ang Temba, Ben and Cam waiting for us having lunch at our lodge in Pheriche. Ben had been to the Himalayan Association rescue clinic and had gotten some good advice and treatment from the doctor and he was looking like a million bucks by the time we caught him. Now we are down at Pangboche and it is a world away thinking about that high, cold, snowy world back at Everest base camp but the views here are amazing. We are looking out of Ang Temba’s window at Everest, Lhotse and Ama Dablam. 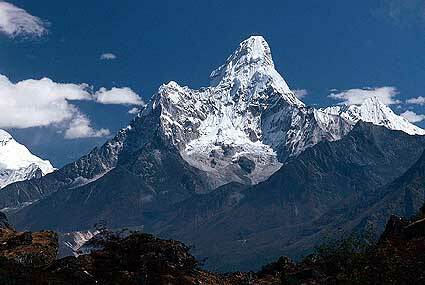 Tomorrow we are thinking about walking to Ama Dablam base camp to get a closer look at that great mountain. We are enjoying our time here with the sherpas as we walk slowly down valley. The air is thicker, and we have a lot of great friends, as we continue our trail back to Lukla and Kathmandu and continue to post our dispatches about our experiences and adventures in the Khumbu.